As I start typing this post, we’re just about to leave for Nagpur. It is 2 PM and the flight back to Bangalore is at 8 PM. Nagpur is some 100 kms away, and we’ll have time to kill at the airport. Meanwhile, there’s a long-tailed shrike brooding on a perch that a green bee-eater habitually sallies from. A large flock of chestnut shouldered petronias skulks in a bush a little to the right. A pair of little brown doves, and a pair of sparrows are starting to nest in two tiny ficus shrubs on the lawn outside. There’s a pair of red vented bulbuls that haunts a bamboo thicket a little to the left. And finally, there’s a tailor bird that is a very occasional visitor to the shrubbery. These are the regular habitués around my room in the Svasara Jungle Lodge. Not an unpleasant place to stay in at all. Not that we’ve had much time to keep track of the local avifauna. It’s been a hectic three days. We did four safaris in all, but the remarkable thing about TATR is the time allowance. The morning safari starts at 6:30 AM and goes on until 11:30 AM. Back for a quick lunch at noon and barely enough time for a battery recharge (cameras’, not ours), and off again for the second safari which starts at 2 PM (gate opening time) and goes on until 6 PM. So five hours in the morning and four hours in the afternoon. Nine hours of safari time each day, with little time for anything else. It is rather tiring. TATR is 650 sq kms of dry deciduous forest, and a dry, warm place. Even in December the days are sultry, though evenings and especially mornings are cold. The teak trees are shedding prodigiously, and the ground in many places is carpeted with the large rotting leaves. 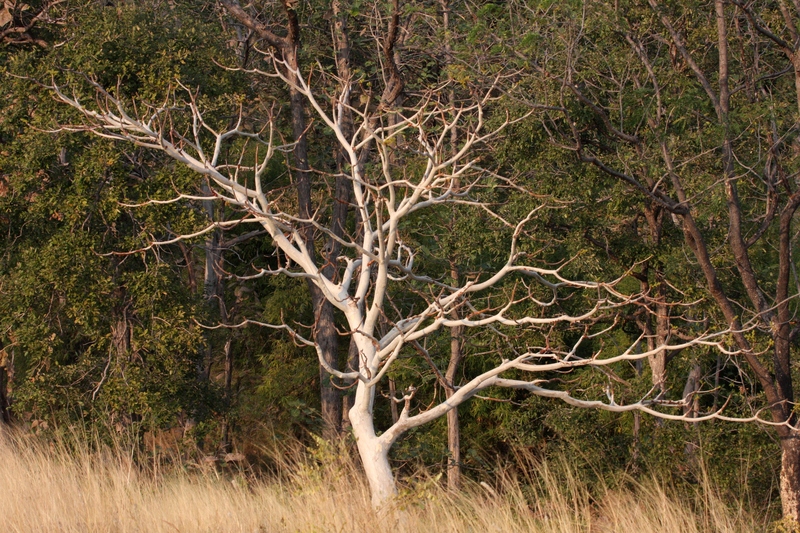 Many of the Mahua trees are bare, as are the Indian ghost trees (in pic below). Crocodile bark and tendu trees still retain their green, as do the jamun trees by the waterlines. After having read about the place lacking the magnificence of Kanha or Corbett, I guess my expectations had been tempered down significantly; Happily, the forest seemed pretty enough in compensation. And the safaris are very productive. We did four safaris in all. Svasara Jungle Lodge is sited a couple of hundred meters from the Kolara gate, which in turn is on the north-eastern periphery of TATR. This gate opens into the Tadoba range. 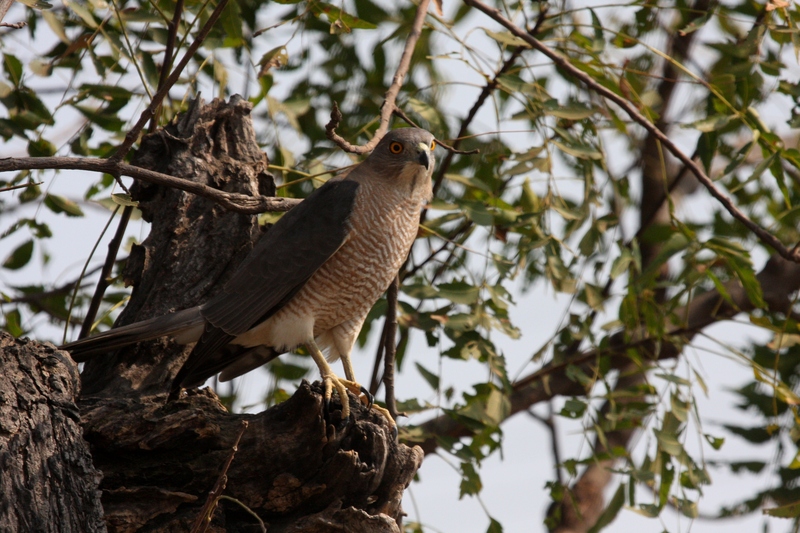 Three of our four safaris were limited to the Tadoba range. 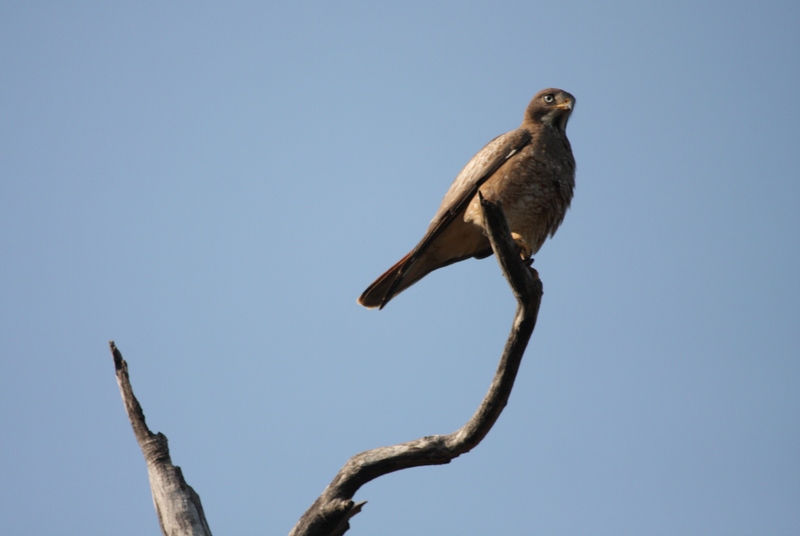 For our second safari (yesterday AM) alone, we passed through the Tadoba range to reach the Katoda gate, and thereon into Andhari (Moharli range). The first safari was an evening one. A short while into it, we sighted a ratel – Mellivora capensis. None of us had ever seen one before, and we were elated. We then reached Panderpauni, with its pretty little lake and vast meadows teeming with chital, langur and wild boar. Tree swifts in large numbers hawked insects on the wing. There was quite a bit of birdlife in the waterhole. A short distance from Panderpauni, on the way to Tadoba lake, we ran into a bunch of Gypsies clustered at a crossroads. One of them had spotted a tigress disappearing into the underbrush. The Gypsies hung around with hopes of the tigress re-emerging for a while, but eventually people started giving up and moving on. Around six Gypsies stayed on, and our patience was finally rewarded. Someone spotted a movement at the far end of the arrow-straight road to our left. Turned out to be P2, a four-year old tigress in fine fettle. She strode down the road unmindful of the cluster of Gypsies, skirted right around us, and ambled into the one road where entry was forbidden. Some of the Gypsies scrambled to loop back for another interception, but the tigress had other ideas. She stepped off the road, into the thickets and disappeared. But P2 was not done with us. In the three remaining safaris, we experienced close encounters with her twice more. 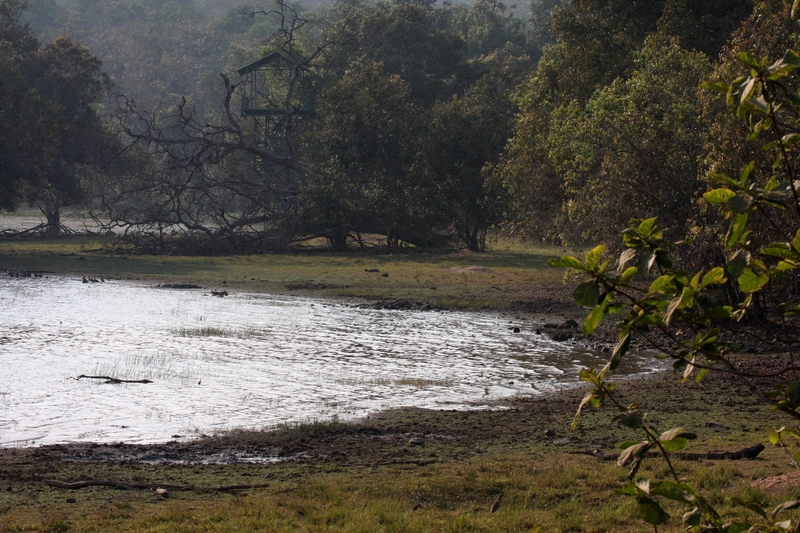 Tadoba lake is a large natural reservoir, with flocks of lesser whistling ducks lining its banks, interspersed with the occasional basking croc. Black headed ibis call noisily from a heronry on the opposite bank. On all visits to this lake, we looked for but failed to spot the grey headed fish eagle and the brown fish owl that were reputed to haunt its banks. Nearby is the little shrine dedicated to the eponymous Gond diety Tadoba or Taru (which is apparently out of bounds to tourists). From here we took the chital road to the Jamunbodi loop, where we spotted a sloth bear about fifty feet off the road – in the late afternoon atypically, and well before sunset. On day two we covered the Moharli range. 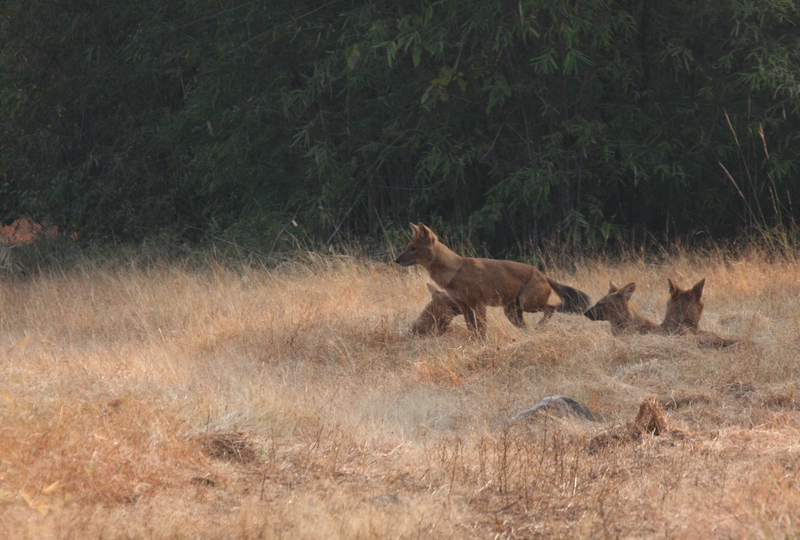 On the Tadoba-Moharli tar road, we stopped by a pack of five dhole cavorting by the roadside. They appeared relaxed, stretching, rolling in the grass and frisking around as these creatures are wont to do, but when a couple more Gypsies piled in, they withdrew a short distance away. 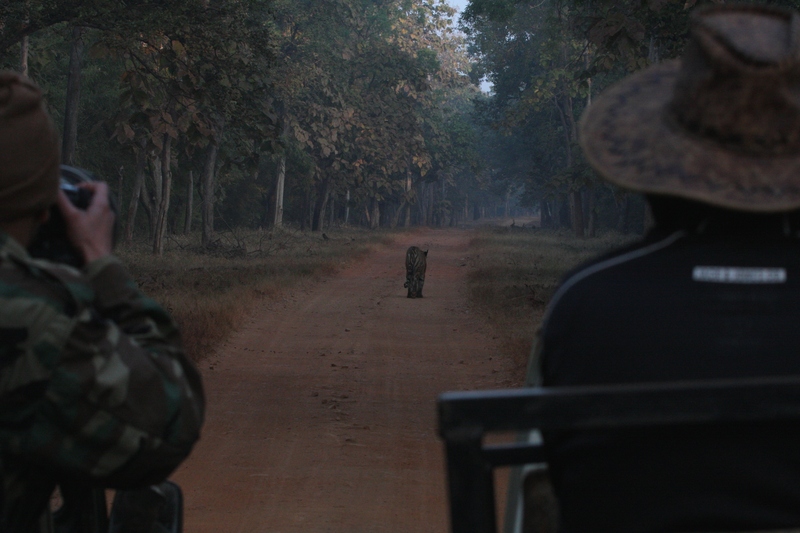 We proceeded to the Katoda checkpost (which delineates the Tadoba and Moharli ranges) for a breakfast break, and by the time we were done and resuming our way to Telia lake, they had brought down a chital just beyond the checkpost. The kill lay in high grass, and little could be seen beyond one or the other dog’s head bobbing above the stalks as it dipped into breakfast. The area around Telia lake on the Jamunjhora loop presents picturesque dark bamboo forests. Thirty percent of Tadoba’s greenery comprises bamboo and there is bamboo everywhere, but Jamunjhora has especially heavy growth. The third safari (evening) was a quiet one, with much of the time spent on birdlife, but in the last half hour, we ran into P2 again, on another arrow-straight road. This time she walked towards us, with one Gypsy ahead of, and three vehicles tailing her. Since among the occupants of these vehicles were the field director and the ranger, we were waved off the road. She marched past our Gypsy and away down the road, completely ignoring everyone around. 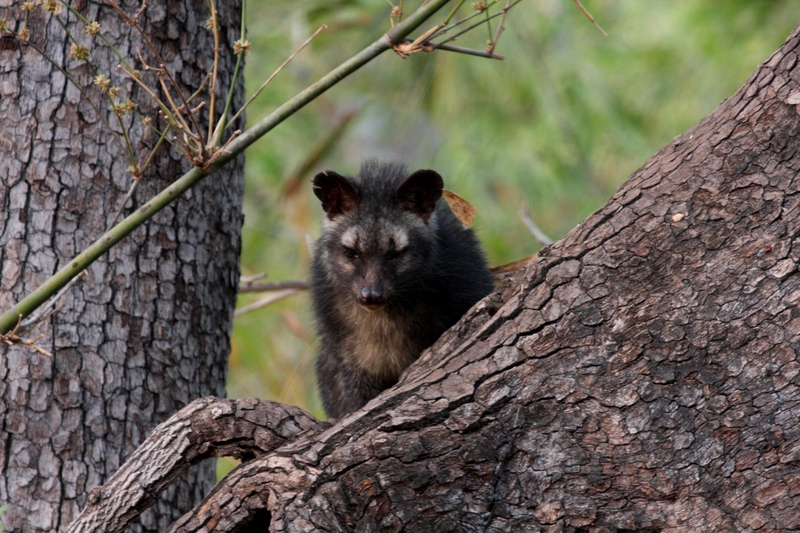 On the way back, we found an Asian palm civet on a bole a few feet from the ground (I had earlier described this as a small Indian civet, but S. Karthikeyan noticed and was kind enough to point this out). Being a little too early in the civet’s day, it was evidently groggy; at any rate, it did nothing for a long while, sitting with somnolent eyes while we sat and watched it. It finally roused itself to do something about all the attention and clambered up the bole and out of sight. The last day’s safari was a morning one. We had covered pretty much all the local megafaunal attractions barring the nilgai and the leopard. Navegaon is a village on the northern periphery that has been relocated out in the past six months. 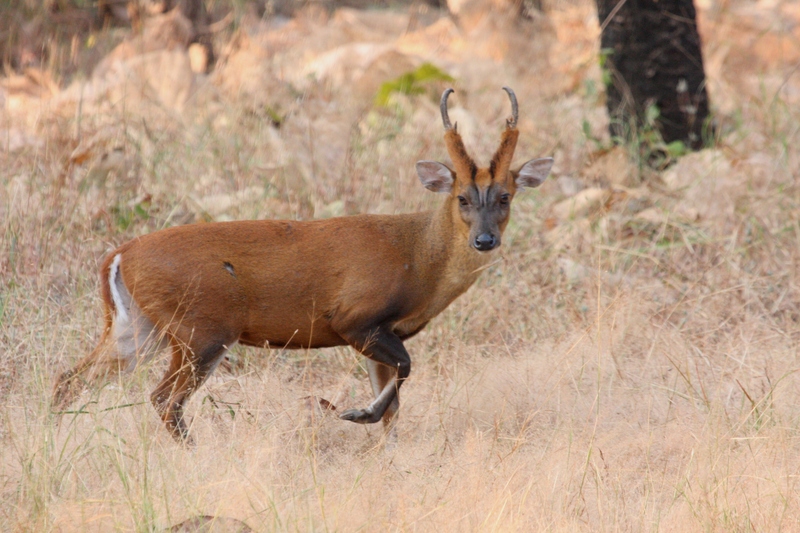 As in Kanha, the sites of relocated villages serve as excellent grassland habitats, supporting a healthy ungulate population. So off we went to Navegaon, looking for nilgai and birds. On the road from Panderpauni to Navegaon, who should we run into but P2. It started off with chital alarm calls. We had stopped over at the Panderpauni waterhole to check on the birdlife when calls started from the other side of the lake. We took the road that loops around the lake and stopped over on another side of the water. A brief flash of stripes, and it was another hurtling ride further down the road to try and intercept her. P2 finally emerged and did her thing – the walk on the road unmindful of the gawking audience. She walked towards us, past us and then away, and two columns of Gypsies, perhaps twelve to fifteen in all tailed her at walking pace. The tigress sauntered along unconcerned, stopping by select trees to mark her scent. This went on for the next fifteen minutes, until she turned off the road and disappeared. 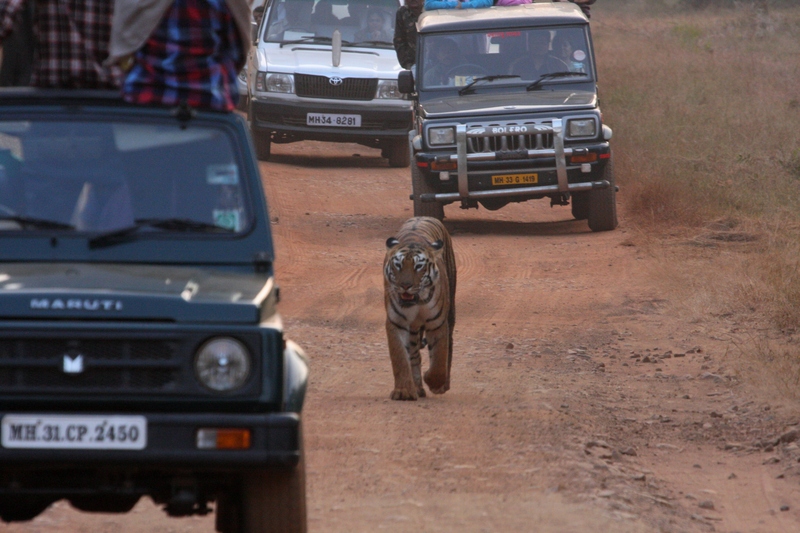 The Gypsy mobbing phenomenon of the popular tiger reserve is undoubtedly unseemly and downright ugly, but I’m not sure what exactly should be done about it. 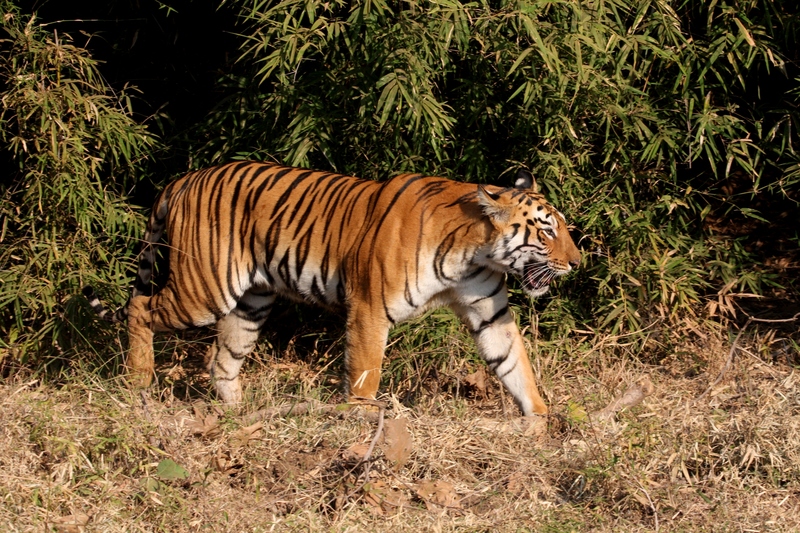 And Tadoba is undeniably tiger-centric. Guides and drivers do not expect tourists to come looking for much else, and at times it almost feels like they have difficulty mentally processing asks for lesser creatures. Having touched on the topic of relocated villages, I should not omit to mention Jamni, which is the first landmark after entering from the Kolara gate. The village is in the process of being relocated, and appears largely deserted. The recently harvested paddy fields around boast of a high incidence of tiger sightings – with the beats of two tigresses P1 and P2 cleaving across this area. 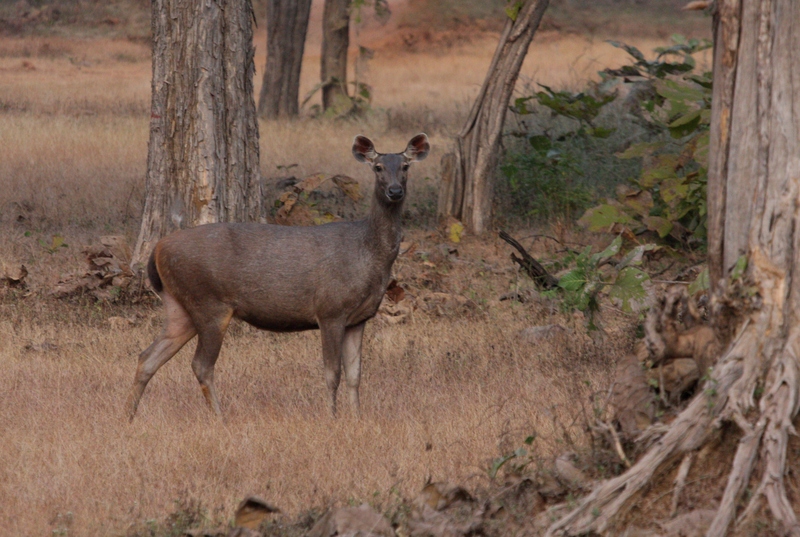 Anyway, we did eventually get to Navegaon, and we did see all the nilgai we could have wished for. And a few herds of gaur thrown in to boot. And plenty of birdlife. I was hoping to meet the couple that has been doing splendid conservation work in Tadoba – Harshawardhan and Poonam Dhanwatey (their organization is called TRACT – Tiger Research and Conservation Trust) – but this privilege will have to wait for the next trip.